Welcome to the ‘Mindful Art’ section of the OPAL Web Site. Here you can find out more about the artwork produced in Mindfulness by Ray James (OPAL’s Founder) and other visiting artists and crafters. 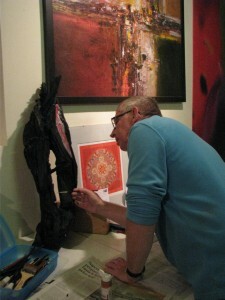 You can read more about Ray and what inspires his art by viewing his page Mindful Art by Ray‘. Details on new art & craft work will be posted periodically along with information about whats going on at the OPAL Art & Crafts Studio, so do visit the site regularly so that you don’t miss out! I have a passion for working with, and up-cycling, natural materials. I believe that everything has its own unique beauty and gain great pleasure in utilising items that would often otherwise be discarded. A native of England, I first visited Ireland in the early 1990’s and immediately fell in love with the Irish landscape. Having made a number of subsequent visits, in 2006 I decided to base myself in Ireland and have found it an inspiring place to live and work. This is a painting that I did using a range of media including oil paint, acrylic, wax from used candles, some PVA glue that had gone off and was destined for the bin. 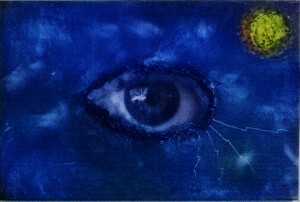 It is entitled ‘The Eye of The Storm‘. I was inspired by a storm we had at the time. It now hangs on display at The OPAL Centre.week before last. It now hangs on display at the OPAL centre in Donamon, Roscommon. I discovered my artistic abilities through my Mindfulness practice. I endeavour to embrace Mindfulness (being fully present in every moment) in all that I do. I initially used Art and Calligraphy as a way of enhancing my Mindfulness and in doing so was blessed with uncovering the creativity that was locked inside me. All of my art work is created in a state of Mindfulness and with the intention of reflecting the natural beauty of all things. I also work as a Mindfulness Based Cognitive Therapist and teach Mindfulness to others. All of my art, craft and sculptures are produced in Mindfulness, with a focus on Mindful Living. I use a range of material to create my art and craft work, much of which I ‘upcycle’. In my Art I often combine mixed media to create abstract pieces reflecting on nature and life. I also sculpt and use pyrography (a form of wood burning). Within my wood craft, I utilise a range of wood including bogwood, driftwood, salvaged timber, etc. My latest Art, Wood Craft and Sculptures have been inspired by Irish Culture and Heritage. Each piece is unique and has its own special meaning.